A look back at all the action from this past weekend! 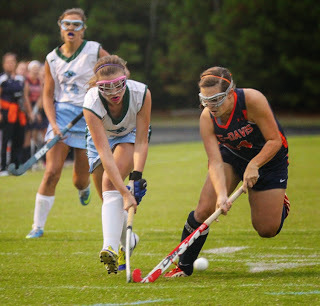 FIELD HOCKEY CONFERENCE TOURNAMENT SCHEDULE FOR OCTOBER 28TH; GOLF NOTE! The winners play for Conference title on Wednesday at Douglas Freeman. TOMORROW, CONFERENCE 16 Tournament begins as Patrick Henry hosts Albemarle at 4:30pm in a semfinal match! GOLF: Good luck to Patrick Henry sophomore Andrea Dill and Atlee freshman Erica Whitehouse who both begin play this morning in the State Girls Golf Championship at Jefferson-Lakeside Country Club in North Henrico near Lakeside! It is a two-day tournament. ALERT: PH Competition Cheer--Conference Champions! 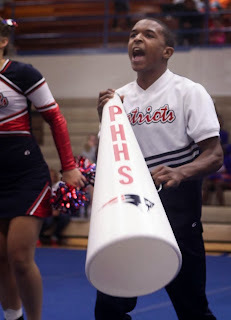 Congratulations to the Patrick Henry Competition Cheer team who won the first-ever Conference 16 Tournament tonight at Orange County High School! 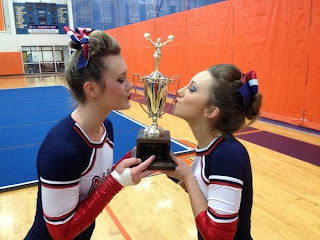 Our thanks to Allen Riddle for this great picture of team members celebrating with the trophy that returns to Ashland! The team advances to the Class 5A North Regional Championships next Saturday at Mount Vernon High School. GAME OF THE WEEK: LEE-DAVIS (3-4, #9 in Class 5A South Region Central Zone) at HANOVER (4-3, #10 in Class 4A South Region) (airtime 6:30pm on 102.9 FM WHAN Radio and online at HanoverCountySports.net). The Confederates' collective back is truly against the wall, needing to win out, and get help elsewhere, if they wish to make the playoffs for the third straight season. Coming off a 41-14 loss at home to Highland Springs, they now have to travel to Hanover, a place they haven't since November 5th, 2005, a 14-13 victory. 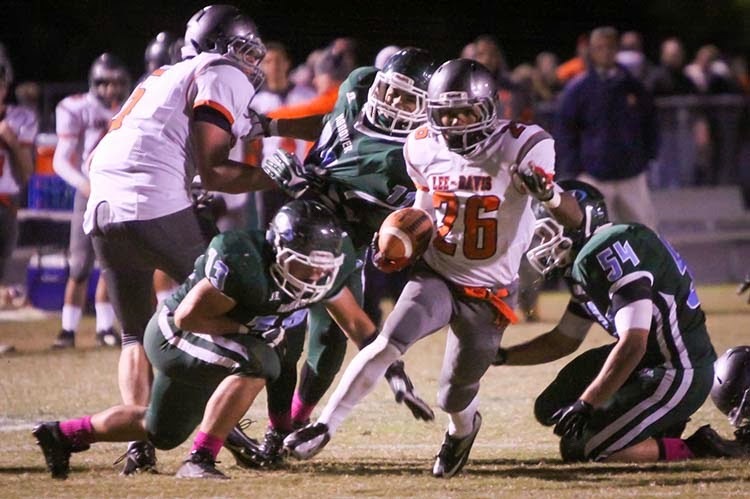 Lee-Davis needs to find a consistent winning rhythm on offense. Hanover knows they've struggled in the passing game and will likely put 8, even 9 in the box to stop Austin Rice and Blake Stattelman. Hanover gave Jalen Elliott a try in the backfield at Armstrong last week and he responded with four rushing touchdowns, three in the second quarter of a 47-30 win. Look for Elliott, freshman Clayton Cheatham and Brooks Coombs to share the rock and for QB Korbin Bordonie to manage the game for head coach Derek Stoudt. The Lee-Davis front four is very good, and must be at their best tonight with the postseason literally on the line. Lee-Davis will NOT be eliminated if they lose tonight, but their chances will diminish significantly. They are over a point behind #8 Mills Godwin for the final playoff berth in Class 5A South Region Central Zone, with Matoaca and Prince George nipping at their heels. Those two teams play each other tonight in what could turn out to be an elimination game. Henrico is currently ahead of both the Warriors (Matoaca) and Royals, but are free-falling, starting at 3-0, but now 3-4 and at Highland Springs tonight. 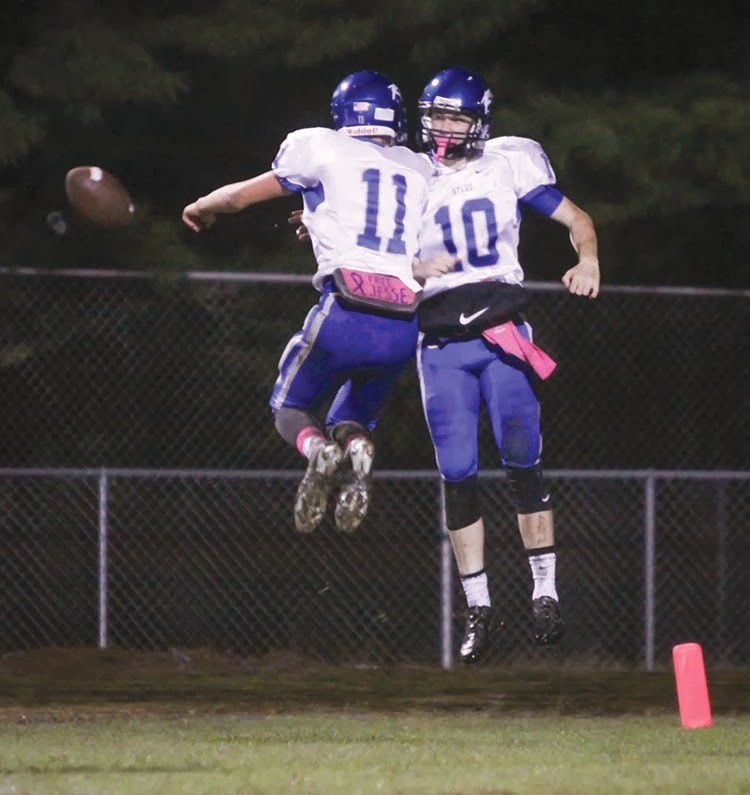 Hanover wants to win out to earn a home game in the first round of the Class 4A South Playoffs, where the Top 16 teams advance regardless of geography. They're currently #10. They'll likely have to win out to make the Top 8 and should not look past tonight at their date with Varina next Friday, otherwise LD could catch them off-guard. Join us LIVE for the game on 102.9 FM, 1430 AM, or here at the link above to listen from anywhere! 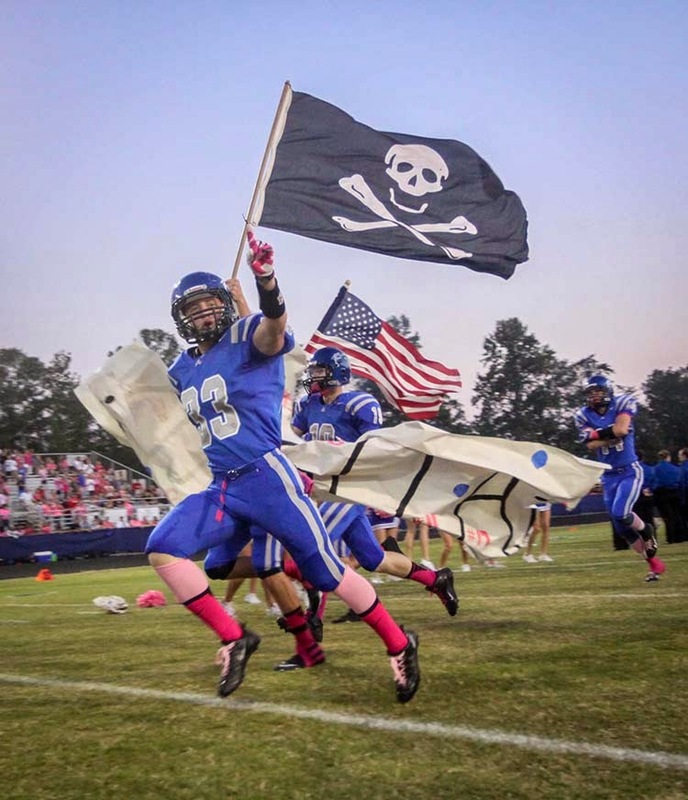 ATLEE (6-1, #3 in Class 5A South Region Central Zone) at ARMSTRONG (2-5, 18th in Class 3A East Region): The Raiders have a trap game tonight. Coming off a 70-0 thrashing of Glen Allen, the Raiders cannot look ahead to next week's home showdown with Highland Springs, as the Wildcats can put up points and hang with good teams, giving Varina fits earlier this season, and scoring 30 on Hanover last Friday. 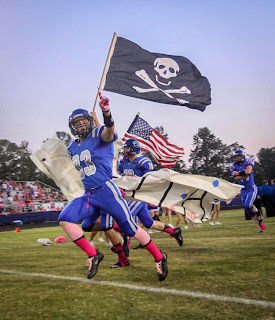 The Raiders hope a win tonight, coupled with a win over Highland Springs next week, could help them clinch the #2 seed in Class 5A South Central Zone, but first things first, they need to take care of Armstrong. You can hear the Patrick Henry/John Marshall game Saturday at 12:45pm exclusively online HERE at HanoverCountySports.net!! ...in the 2013 regular season for Field Hockey, and the Hanover Hawks are on a roll! 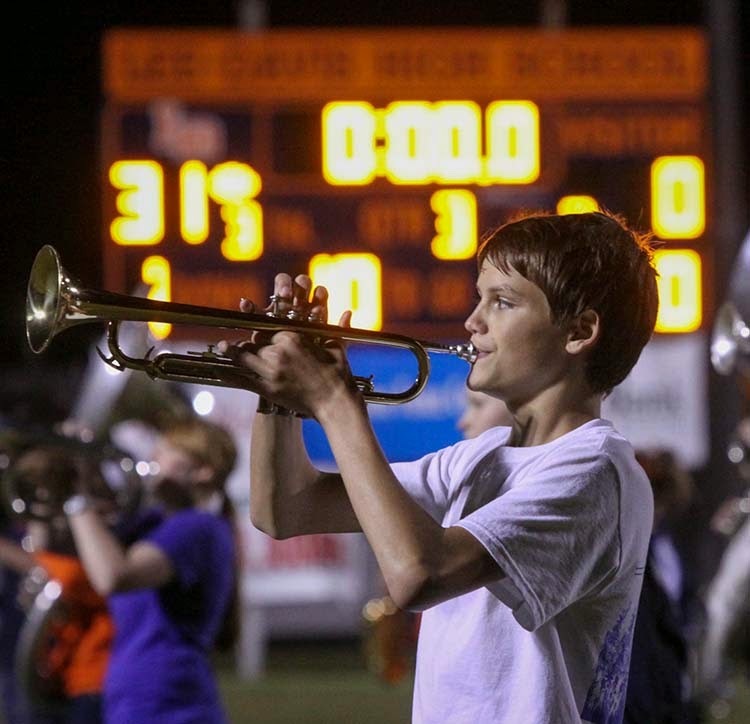 They haven't lost since September 11th at Lee-Davis, a game heard live on HCS Media Network. Since then they've run the table, including giving those Confederates their only loss of the year. Tonight they conclude the regular season at Highland Springs, looking to finish 14-2 and position themselves well for next week's conference tournament. But remember, with only one state champion crowned in a combined Class 1A--4A setup, undefeated Maggie Walker Governors School looms in their conference tourney. The top two teams from next week's event moves on to what will be known as the "4A South Region Tournament" the week of November 4th. Lee-Davis, at 14-1, conclude their regular season with a home makeup game against Atlee (9-5) Friday at 5pm. Both teams are prepping for 5A postseason action, as their four-team Conference 11 Tournament with Henrico and Highland Springs will hold semifinals Monday at Henrico and the championship game Wednesday at Douglas Freeman. 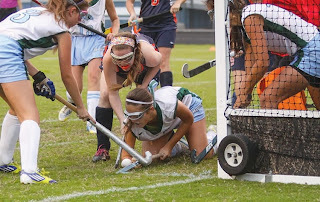 The Henrico County teams in Conference 11 were moved to Class 5A North for Field Hockey to even out the regional brackets. Thus, Deep Run, Freeman, Godwin and Hermitage will have their own "Conference 14" tournament next week, the top two moving to 5A North Regionals where they may see Patrick Henry, whose Conference 16 Tourney next week will consist of just three teams. 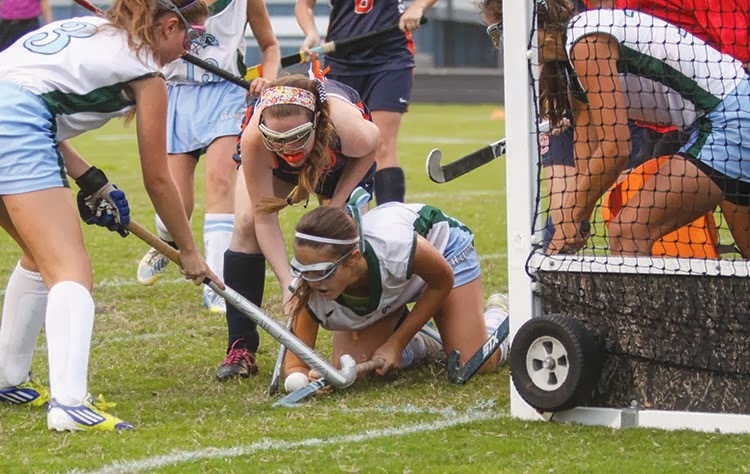 Strap in, it's gonna be a wild ride on our maiden voyage through the new Field Hockey playoffs! The newly formed Lee-Davis High School Athletic Hall of Fame has announced its inaugural class to be inducted on January 17, 2014. She made an impact as a freshman, just like Lauren McIntyre, and fittingly, both juniors have announced the verbal decisions for college this week to HCS! 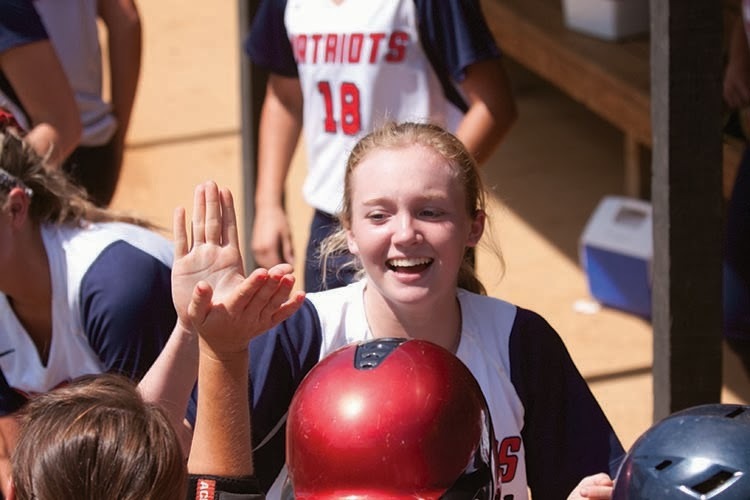 Congratulations to Patrick Henry junior softball shortstop Paige Mitchell, who has announced she has verbally committed to play college softball for the Dukes of James Madison University!! Paige has been a standout in her first two seasons for Patrick Henry, including starting every game at shortstop as a freshman for the 2012 squad that advanced to the State Group AAA Championship Game! Mitchell and the rest of her Patriot teammates begin their quest for a Conference 16 and Class 4A championship come official practice in February. An early surge from Lee-Davis, two goals in three minutes to break a tie and tie it again, and a game-winner with less than 30 seconds left. What a game! Congratulations to Lee-Davis' junior softball pitcher Lauren McIntyre, who has verbally committed to play collegiately at Radford University! Lauren was thrust upon the Central Region softball scene in 2012 when Kelly Heinz's arm injury prevented her from pitching her senior year. 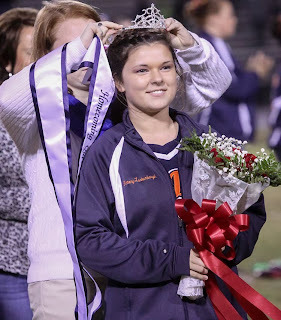 As a freshman, Lauren led Lee-Davis to the Capital District title and the Central Region tournament! 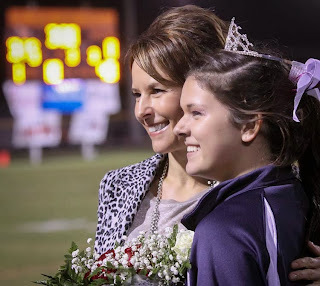 In 2013, she helped Lee-Davis win the Capital District Tournament and again make the Central Region final four. She has two years of eligibility remaining for the Confederates, which makes Lee-Davis fans giddy with anticipation and excitement. As first reported by the Richmond Times-Dispatch Sunday evening, Atlee offensive lineman Nick Clarke has committed to play college football for the Monarchs of Old Dominion University. Atlee head coach Roscoe Johnson confirmed this to HCS late Sunday night. "It's exciting to have two FBS offensive lineman on the same team," Johnson said. Clarke, who will play in Conference USA, joins Alec Eberle, who committed earlier this year to Florida State University of the ACC. 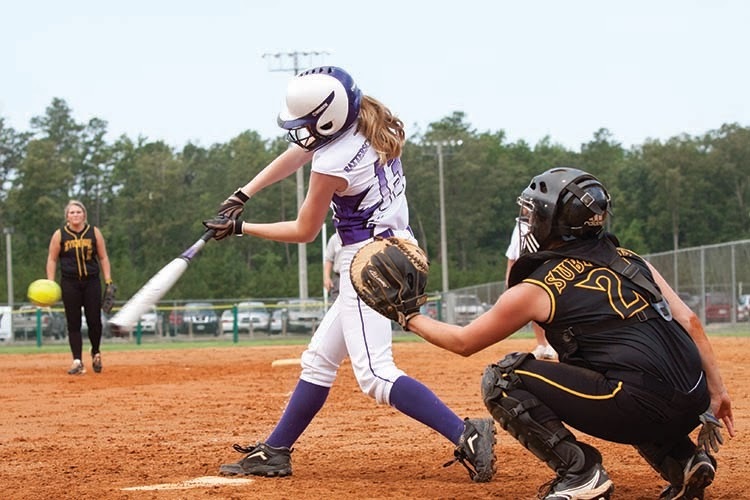 HCS also hears of a verbal committment from the world of softball and has spoken exclusively with the player involved. But, we are withholding this announcement at this time while the player checks on issues regarding eligibility and other NCAA rules before making the announcement public via the media. Stay tuned! 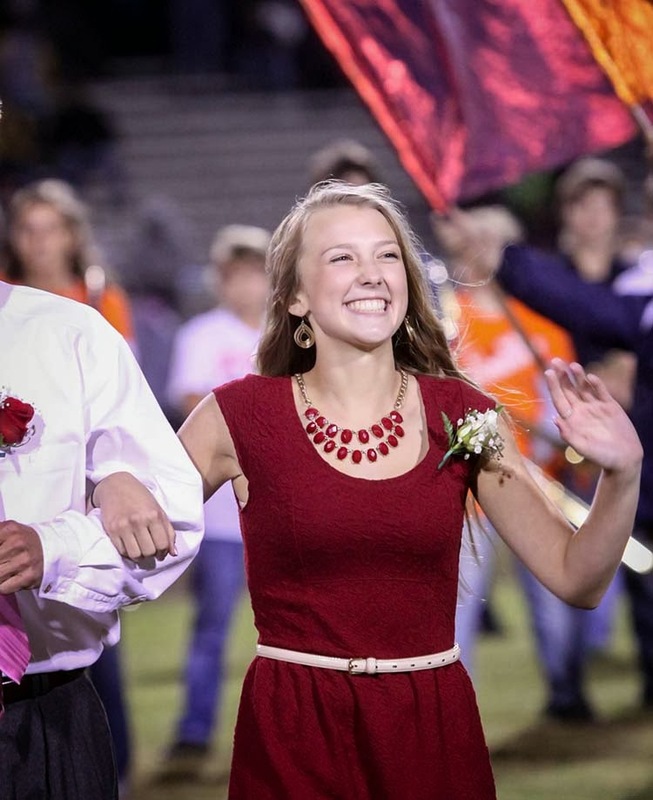 From an upset victory to a Homecoming Court, a look at Week 6 at two of our county's four games this past Friday! It hadn't happened since the Clinton Administration. Until tonight. 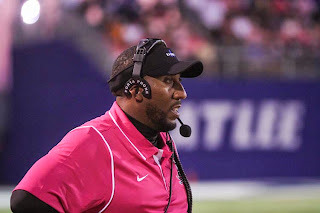 Atlee Coach Roscoe Johnson says his team finally won in "all three phases" of the game, as the Raiders shocked previously unbeaten Varina in an overtime classic Friday night, 31-28, in Eastern Henrico. The soggy weather kept the crowd down, but not the excitement generated by the Blue Devils and Raiders. Varina struck early, catapulted by a 47-yard misdirection run by Leander Cutler. That run set up Shawn Tyler's 15-yard TD run around left end for a 6-0 lead, as the PAT was blocked. The Raiders then scored 14 unanswered points. 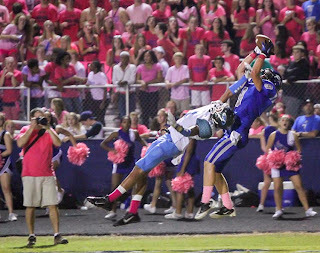 Atlee came out firing, and, for the most part early, quarterback Reid McCoy misfired. But Atlee kept at their game plan, and McCoy found Daniel Glymph in the end zone for a 32 yard touchdown to make the score 7-6 at 5:26 left, 1st quarter. Then, in the final minute of the first quarter, McCoy struck again, this time to Zack Jacobs from 33 yards and the Raiders led 14-6. Later in the second quarter, Atlee looked to have extended their lead, but a touchdown pass over the middle to Glymph was disallowed due to an ineligible receiver downfield penalty, keeping the score 14-6 at intermission. The third quarter changed everything. On the second play from scrimmage, Lamont Stubbs busted loose up the middle for a 64 yard touchdown run for a 21-6 lead. 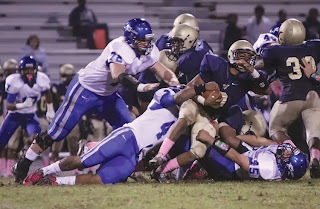 Then, on a subsequent Varina possession, quarterback Tim Minor went down, and left the field. He seemed shaken up, but little did we know his night was over. Backup Corey Finney came in and looked completely overwhelmed. 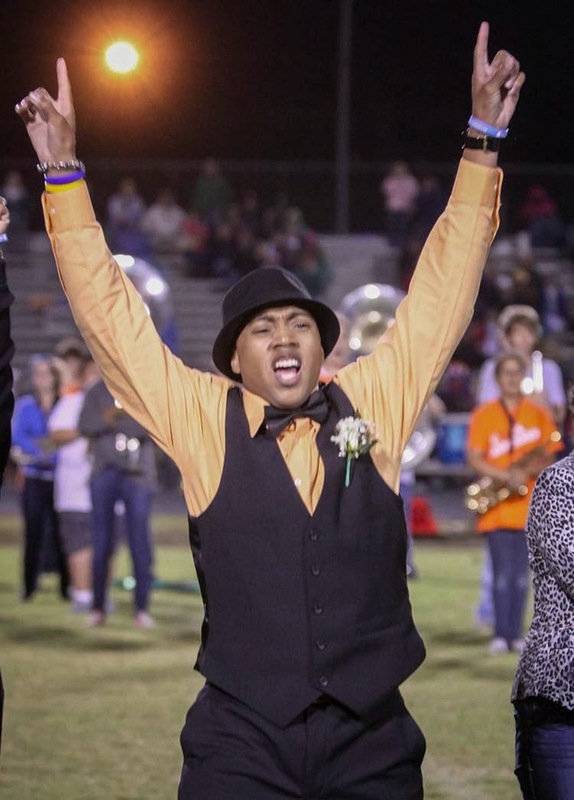 After a punt, Varina held, got the ball back, and Finney continued looking overwhelmed. Wisely, Varina head coach Stu Brown called time, calmly talked to his senior, and Finney responded. Big time. Finney threw down the left sideline to Ya Ya Konate, who beat single coverage for the touchdown halfway through the 3rd quarter. 2-point try was good, and the lead was 21-14. On the next possession, Finney threw a quick ten-yard out to Donovan Dowling, who shook off his defender and rambled untouched 61 yards to paydirt. Dowling caught the two-point try, and within three minutes of game time, the Blue Devils had scored 16 points to lead 22-21. The Raiders were now the ones looking dazed. But they survived the heavyweight punch and returned with one of their own. Pinning Varina deep in their own territory, Tye Burriss took a punt near midfield and rambled to the Varina 20 before Dowling used the face mask to drag him down. The personal foul penalty gave Atlee first and goal at the five. With mere seconds left in the 3rd, Stubbs scored his 2nd touchdown of the quarter for a 28-22 Raiders lead. Amazingly, the fourth quarter only saw one score after a third quarter of 30 combined points. With 6:52 to go, Finney hit Konate again from 25 yards out to tie the game. In a decision Brown may now regret, Varina went for the PAT rather than for two. The snap was low, not handled by the holder, and the kicker never had a chance. The tie was preserved. Huge blown chance for Varina. Neither team could find the end zone in the final minutes, though Atlee had a shot in the final 92 seconds from midfield but couldn't get in field goal range. A punt pinned Varina back to their 7. One running play later, it was time for overtime. Varina started on offense first and caught a break on an iffy pass interference penalty against Atlee giving them 3rd down at the 5 (in overtime, a team gets four downs from the 10 yard line). They gained three on third down, but on 4th down from the 2, the Raider defense stiffened, keeping Varina out of the end zone. Atlee's drive went backwards after a holding call on a Reid McCoy run put the ball at the 19. On 3rd and goal at the 20, rather than run to set kicker Ryan Molin up in the center of the field, Atlee went for a swing pass right side; a play that hadn't worked all night long. McCoy found Stubbs, who ran to the 10, setting up the 27-yard field goal attempt from the right hashmark for Molin. The field was in horrendous condition. Blades of grass? Nowhere to be found. 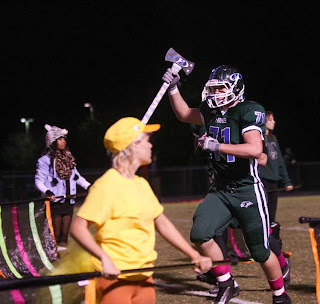 Somehow, Molin found footing, planted, and nailed the field goal with authority, high and deep into the Varina night, and the celebration began. 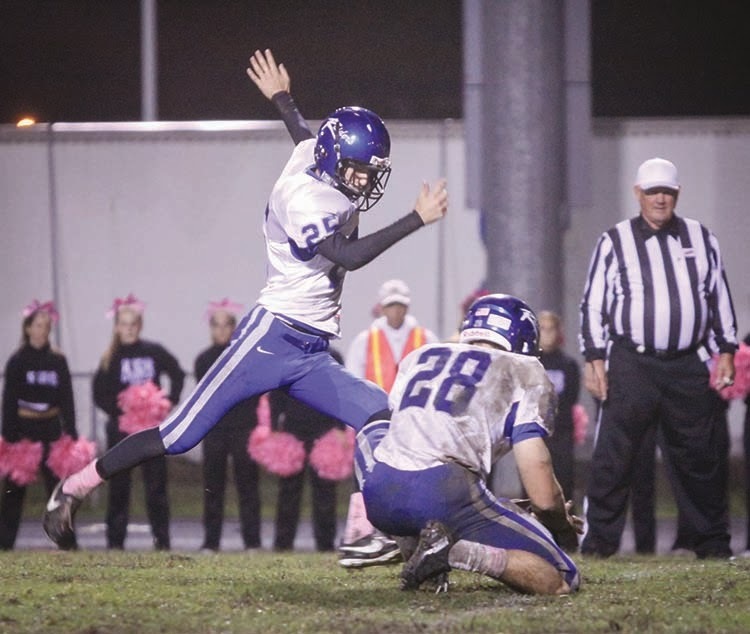 "I didn't even see the kick," Johnson told HCS Media during live internet post-game coverage. 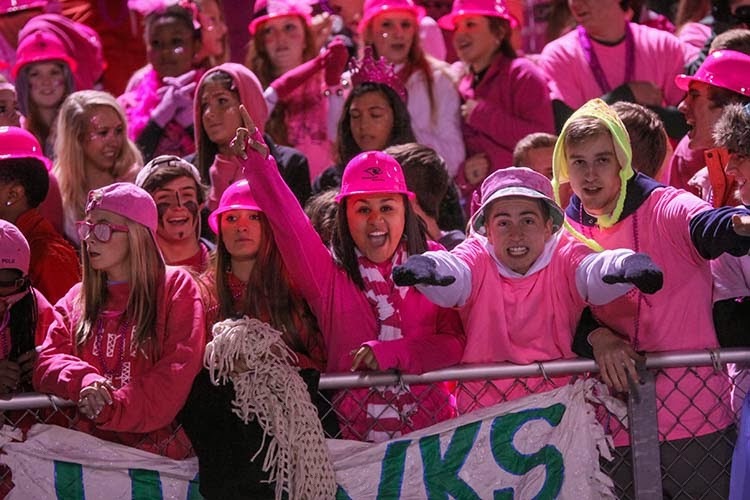 "I looked toward the fans and when they started celebrating, I ran onto the field." Molin was mobbed by his Raider teammates, and the win was secured. Atlee goes to 5-1, Varina drops to 5-1 and hopes to get their starting quarterback back soon. Minor left on crutches, going for treatment after the game. Varina goes to Henrico, then hosts Glen Allen before finishing with both Hanover and Highland Springs on the road, where they will need Minor, and especially Anderson, back and healthy. The Raiders go to Glen Allen next week. 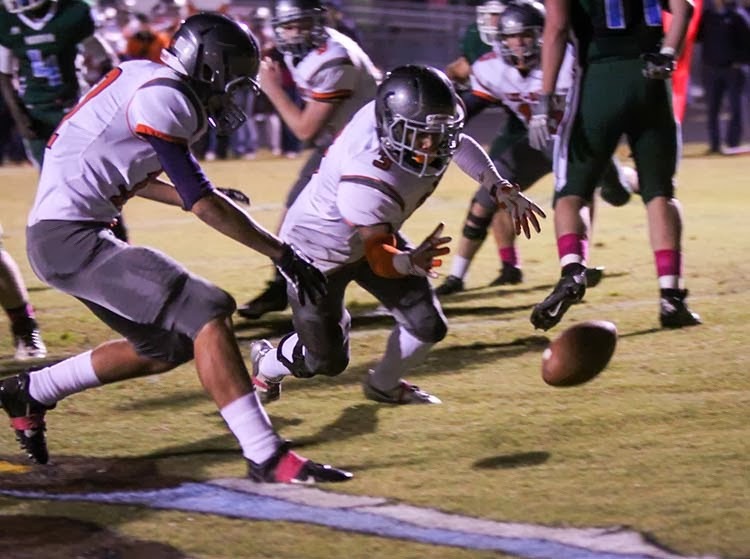 The Jaguars ran into a buzzsaw at Lee-Davis Friday, as the Confederates evened their record at 3-3, scoring 31 in the first half en route to a 38-6 victory. 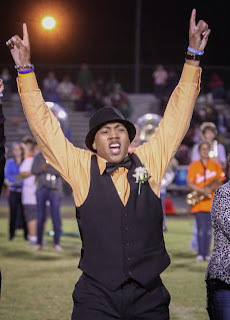 Donald Kidd, on his birthday, scored twice, and registered three sacks defensively as Lee-Davis now prepares to welcome Highland Springs (5-1) next Friday, which will be the Game of the Week on WHAN Radio (102.9 FM) and here at HanoverCountySports.net. 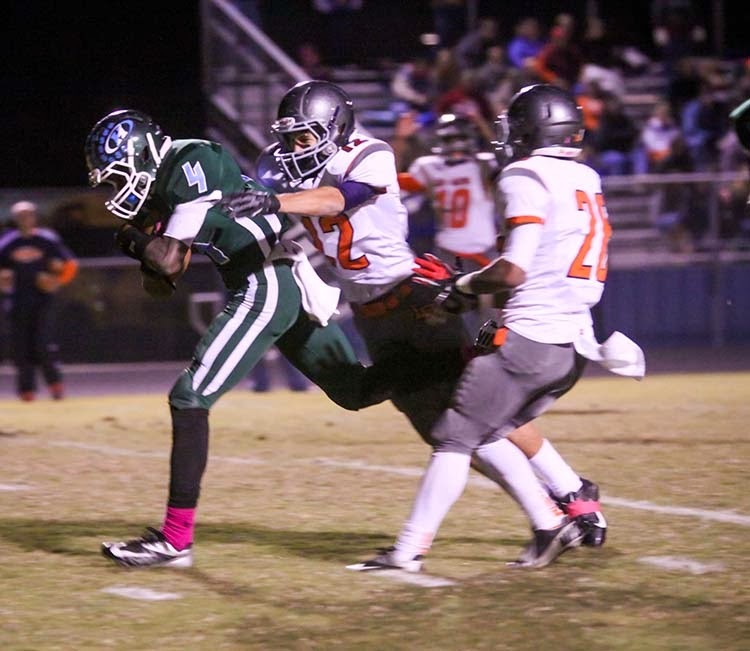 Hanover ended their three-game skid with a 15-0 shutout of Henrico. A safety was sandwiched by an early 1st quarter and late 4th quarter touchdown as Brooks Coombs returned to action for the Hawks (3-3), who next face Armstrong. 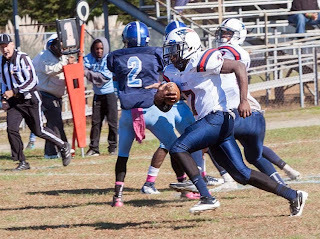 Patrick Henry's 2013 futility continued as J.R. Tucker thumped the Patriots (0-6) 47-7 on the Tigers' homecoming night in the West End. 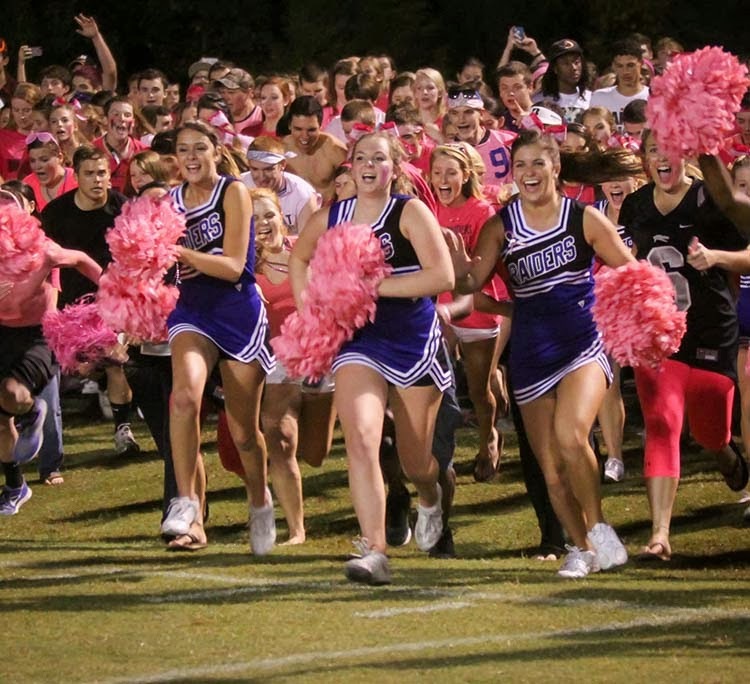 Tucker, who started 0-3, is now 3-3 and suddenly back in the playoff picture in Class 4A South, just like Hanover. So far, no games are postponed, it's full steam ahead for all of tonight's action; but we suggest a rain poncho no matter where you go! Atlee (4-1) at Varina (5-0): After their best performance of the season defensively, can the Raiders stop the unbeaten Blue Devils? 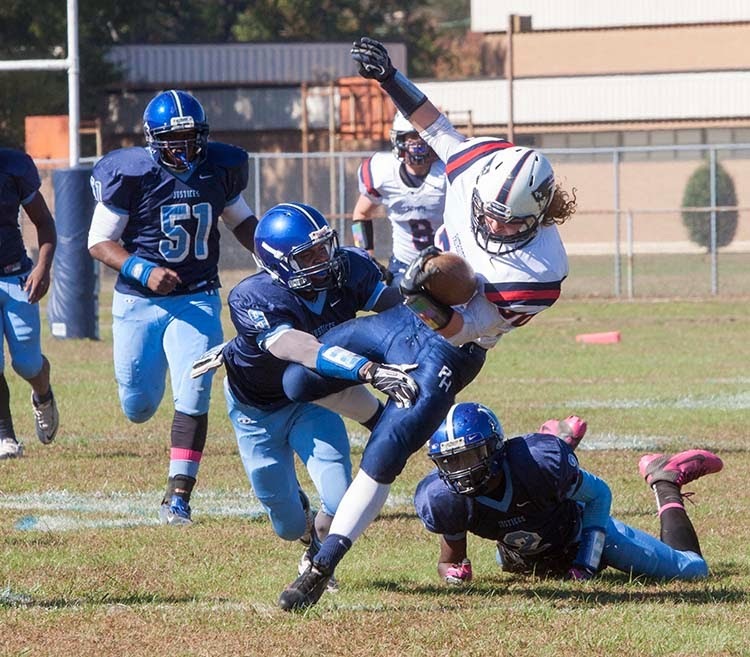 Varina will be without its top running back, Herb Anderson, out with a concussion. But others will step in. 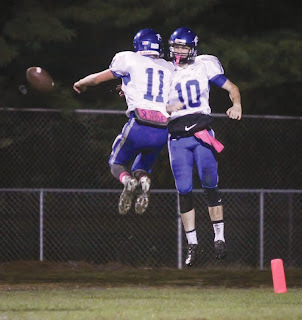 LISTEN LIVE to Atlee/Varina tonight at 7PM exclusively online at the link above this post HERE at HanoverCountySports.net, then hear a special rebroadcast of the game Saturday at 1pm on WHAN, 102.9 FM/1430 AM. Henrico (3-2) at Hanover (2-3): A must win for the Hawks to reenter the Top 16 in Class 4A South that will qualify for the postseason. These two teams desperate for a win; Warriors have lost two straight, the Hawks three. Glen Allen (3-2) at Lee-Davis (2-3): Another chance for the young Jaguars to get a "signature" win for their program, on the road against a Lee-Davis team who beat them soundly each of the past two seasons. Another chance for Lee-Davis to reenter the 5A South playoff picture by getting back to .500 after learning this week their road to the playoffs is now much tougher with 5A South AD's and Administrators deciding to "zone" the playoffs, so, instead of the Top 16 teams in VHSL Rider Points making the postseason, it's the Top 8 in Conferences 9/10 combined, the Top 8 in Conferences 11/12 combined. 11 is where Lee-Davis and Atlee are. As of today, Lee-Davis has more VHSL points than the #8 team in Conferences 9/10, but would miss the playoffs anyway. Their margin for error, frankly, is about zero. 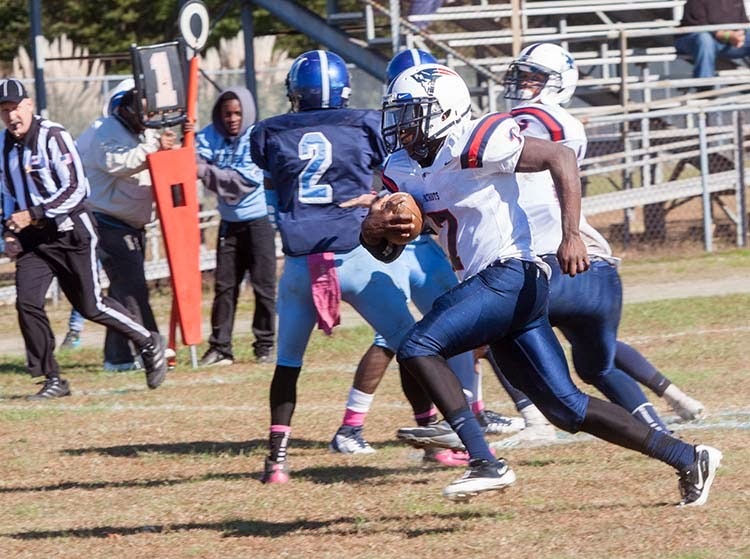 Patrick Henry (0-5) at J.R. Tucker (2-3): Is tonight the night Jonathan Clark gets his first win as PH head coach? The Patriots have dominated this series, losing just once in the last decade, 35-28 in 2009. But Tucker and its unconventional offense has won two straight and its their homecoming, AND they are just outside the Top 16 who make the postseason in Class 4A South. The Patriots could be running into a buzzsaw tonight. 1) LISTEN to Atlee/Varina LIVE at HanoverCountySports.net on your tablet, smartphone or laptop at 7pm. Radio coverage is delayed to Saturday due to Randolph-Macon football. 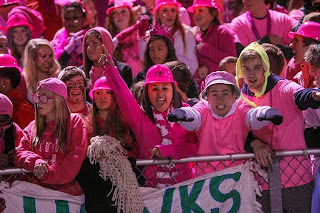 3) SEND US your PICTURES from anywhere; on Twitter send using hashtag #GOTW or share on Instagram at "HCSMedia"! Both the Atlee at Lee-Davis and Glen Allen at Hanover games for this evening have been postponed due to rain. NO makeup dates are available yet, as it looks like we're going into a cycle of possibly several days of rain due to a storm off the coast. If it continues to rain and it affects JV football games tomorrow, we'll keep you posted. NOTE: When the Atlee/Lee-Davis game is rescheduled, we will remind you of the Brain Cancer Awareness Event that was planned for this evening's game!! HCS NOTE: We have bolded the decisions where, in 5A South and 6A South, teams will earn playoffs in groups of eight via two conferences based on region, whereas the rest of the state allows the top 16 teams in each region regardless of location getting in based on VHSL rider points. In other words, there is a GOOD chance that a team in Richmond (5A), or Hampton Roads (6A), may have more VHSL rider points than a team from another part of their "Region", but, because they are 9th best in their newly created "subregion", they are OUT of the playoffs. We suspected this could happen, we've talked with noted football expert Rod Johnson of VirginiaPreps.com and he confirms the possibility is most definitely there, especially for Richmond schools in 5A and Hampton Roads schools in 6A (Richmond area only has four schools in 6A South). If/when this happens, there should be an outrage of the highest order. It's one thing for the Central Region to bury its head in the sand and have short playoff schedules, meaning several 9-1 teams (like 5-7, not 1 or 2) in the past 15 years MISSED the playoffs, but it's another thing entirely for the governing body of high school sports in Virginia, the VHSL, to just allow, in October, these new "regions" to go off on their own and decide how to run the playoffs. If Team A has more VHSL rider points than Team B in the 5A or 6A South Region, but because they are 9th in their newly formed "subregion" (the name we're giving it) they won't get into the playoffs, WHY even HAVE the rider point system to begin with?? We will anxiously await November 8th and 9th to arrive and hope that a team, or multiple teams, do not get shafted out of their earned postseason opportunity. You can bet that we'll breathe a sigh of relief if it doesn't happen, and we'll be among the loudest critics if it does. ---The field hockey showdown between unbeaten Lee-Davis and Hanover at Hanover was rained out; rescheduled for Tuesday, October 15th, 6pm. It was a good night for the road team in another renewal of the Atlee/Lee-Davis volleyball rivalry. 1) Atlee's girls team went to Lee-Davis, coming away with another 3-0 victory. But that final isn't indicative of just how competitive the match was. Only in the first set did Atlee put on a command performance, taking the lead early and rolling to a 25-14 win. Lee-Davis responded by leading most of set two, including a set point at 24-23. But Atlee rose to the occasion, winning the next three points to take the set 26-24, and the momentum into set three. But Lee-Davis (10-5) wouldn't go away, staying a point or two behind Atlee most of the set before the Raiders pulled away near the end and celebrate a hard-fought win at 25-20. Atlee (12-1) hasn't lost a set since August 31st at the Virginia Volleyball Showcase, winning 25 sets in a row. After hosting Glen Allen Tuesday, the Raiders head to Roanoke for the Cave Spring Tournament, featuring Kellam, the team Atlee fell to in the 2012 state championship game. 2) The Lee-Davis boys walked away from Atlee's gym with another five-set thrilling win, as Carson Caudell and Jordan Lafferty each tallied 19 kills to lead the Confederates to a win by scores of 25-22, 18-25, 26-28, 25-22, 16-14. Eric Rohr led Atlee (7-8) with 22 kills. Lee-Davis moves to 8-4 with the win. 3) Easy night for Hanover and Patrick Henry volleyball as the Hawks girls swept Armstrong (25-5, 25-5, 25-6). Sarah Belcher with two kills and 7 aces for Hanover, breaking their three-game losing skid tonight. 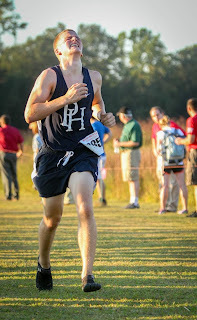 The Hanover boys also swept Armstrong 3-0, 25-9, 25-12, 25-15. The Hawks move to 6-3 with the win. Patrick Henry's boys and girls teams swept Thomas Jefferson on the road in three sets, each making quick work of the Vikings. 4) Our one received JV Football Final so far saw Atlee shut out Hanover 35-0. Our WHAN Radio Game of the Week pits 2-2 Hanover at 3-1 Atlee. But this game is much deeper than that, an experience with two of the best student sections in Virginia, thousands descending upon the stadium. It's neighbor versus neighbor, and their only meeting of the year guaranteed, since Hanover is in Class 4A for postseason, while Atlee is Class 5A. Listen LIVE at 6:30 to Rob Witham's play-by-play coverage of the Hawks and Raiders on 102.9 FM and 1430 AM and also at the link available at HanoverCountySports.net! We will be the ONLY radio station offering live coverage of the game on the FM dial! 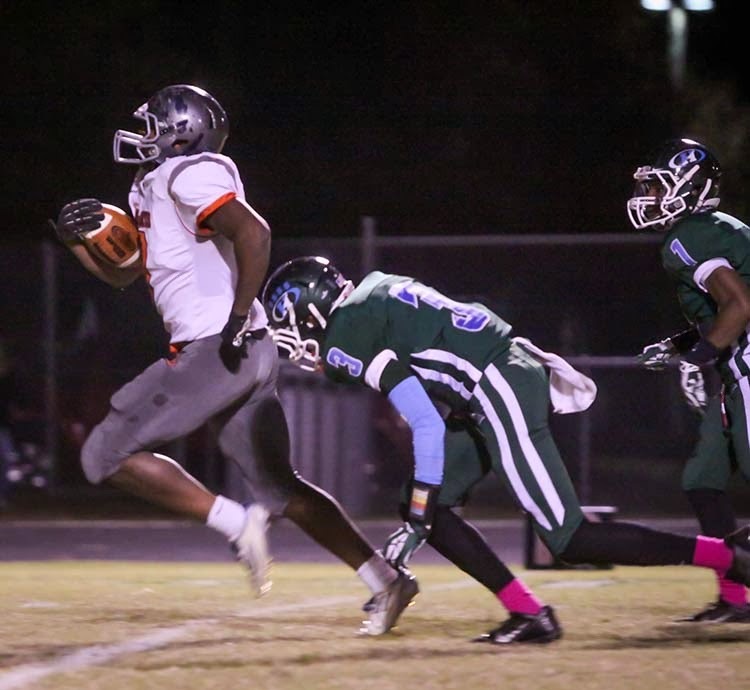 But there's more: Lee-Davis (1-3) is in a critical position Friday night traveling to 3-1 Henrico. The Warriors came back to earth, losing 38-14 to Atlee last week in a game where Atlee scored all of its points before intermission and the crowning of the Homecoming Court. But Henrico is talented offensively, led by quarterback Malik White, and should give them a battle at home. If Lee-Davis falls to 1-4 with Highland Springs, Hanover, Atlee and Glen Allen still ahead of them, their playoff hopes could be in deep trouble. 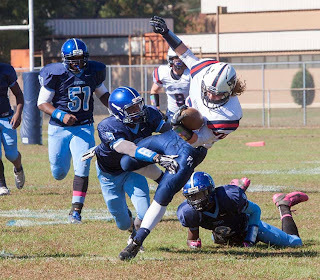 Patrick Henry (0-4) is still trying to give head coach Jonathan Clark his first varsity coaching win. 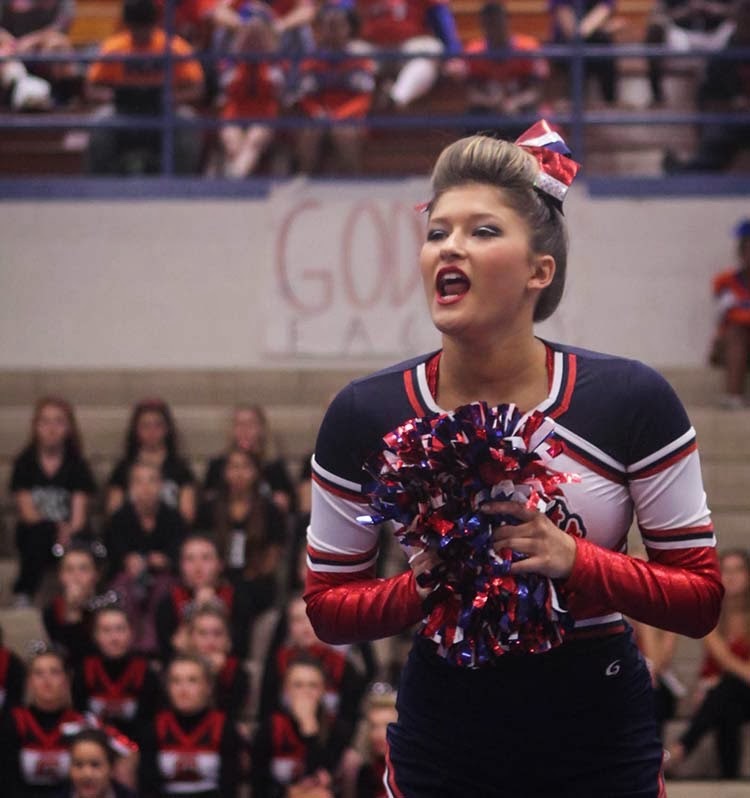 It won't be an easy task as the Patriots must face Hermitage (2-2) in Ashland. The Patriots haven't beaten Hermitage in Ashland since 2005, the last year PH went 10-0 in the regular season. 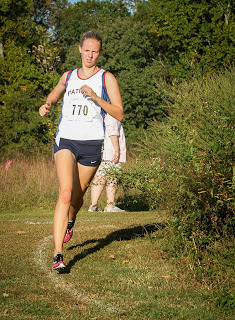 The Patrick Henry girls took 6th, the boys 5th, in an old fashioned "Colonial District" meet at Pole Green Park yesterday. Some snapshots from the event! 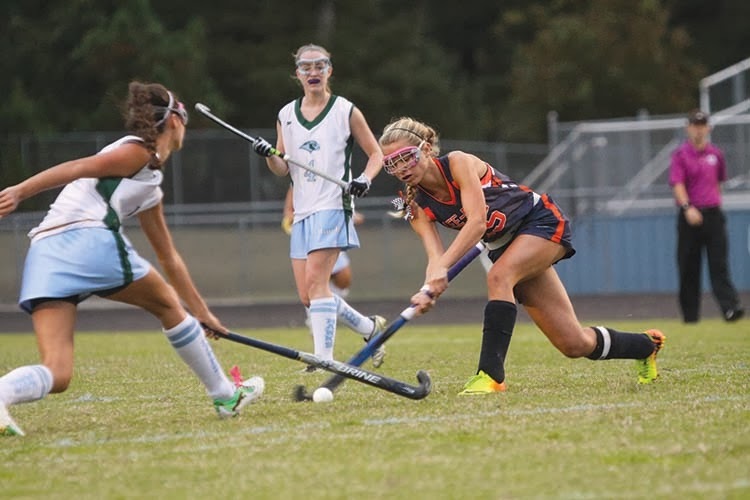 FIELD HOCKEY: Lee-Davis improves to 10-0 with a 2-1 road win over perennial power Mills Godwin. Hanover rode the play of Michelle Knizner, who scored 4 of the Hawks' 7 goals in a 7-0 shutout of Highland Springs to go to 8-2. 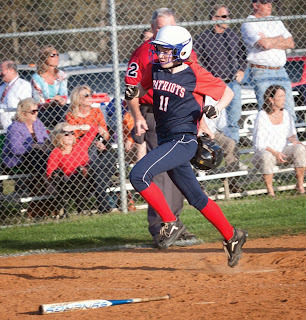 Patrick Henry began a rough week of road games by falling at Deep Run by a 4-0 count. The Patriots are now 4-6. GOLF: Hanover placed 3rd in team compeition, just outside the regional qualifiers at the Conference 20 Tournament on Monday. 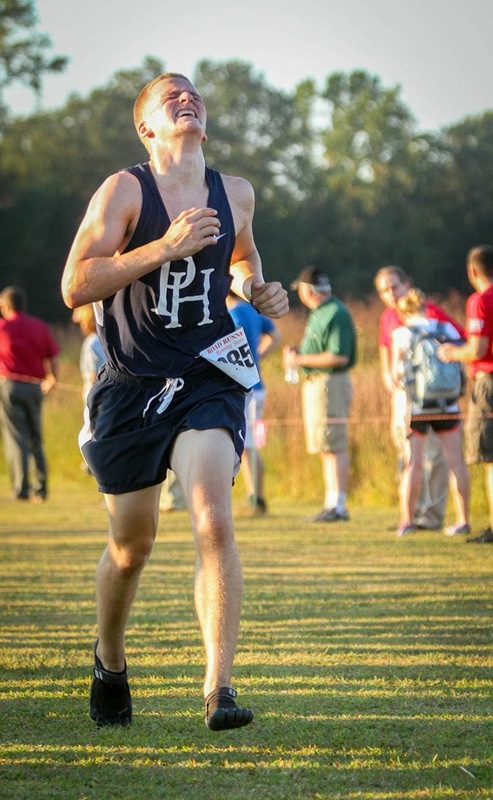 Meanwhile, in Conference 11, Atlee placed 3rd in team standings, Lee-Davis 4th. Tons of volleyball action! In boys play, Atlee is at Henrico, Patrick Henry goes to Douglas Freeman for a big showdown, Varina comes to Hanover and Glen Allen travels to Lee-Davis. On the girls side, Henrico must come to Atlee to face the top girls team in the region, while Douglas Freeman goes to Ashland to take on the Patriots, Hanover goes to Varina, and Lee-Davis travels to Glen Allen. We will be LIVE TWEETING from Lee-Davis/Glen Allen girls volleyball Tuesday night at 7pm. If YOU are at or are participating in another game, help us! Fans, tweet us in-score updates! Players, tweet us AFTER the match and AFTER your coach dismisses you. We love getting score updates and finals that we can share with everyone! Thanks for helping HCS remain your top source for all things Hanover County, on and off the court! COLLEGE: Randolph-Macon Men's Soccer is home to Randolph at 4:30 today while the ladies are at Bridgewater for a 4pm contest.